Belay one rescuer to the edge of the crevasse to check out the climber's situation closely (fig. 13-6c). The rescuer can be belayed from the anchor by a teammate. 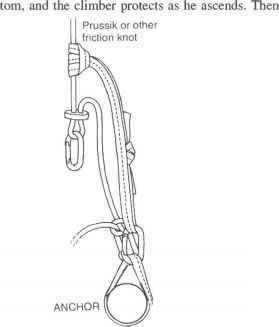 Or the rescuer can operate with a self-belay—attaching a prusik loop to the rope that runs from the anchor to the fallen climber, then sliding this prusik along the rope as the rescuer moves toward the crevasse edge. On the way, the rescuer can probe the area and check for any other hazards that might endanger the rescue. The rescuer will try to talk with the fallen climber. 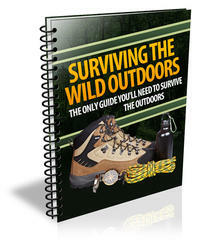 If there is no response, one person can rappel or be lowered on belay into the crevasse to help the fallen climber. But if there is a response, the rescuer can ask if the climber needs clothing, is injured, is able to get into prusik slings, and so forth. The person who fell in should be able to say whether self-rescue is a good possibility—by ice-climbing out or prusiking out—or whether a hoist from above will be needed.